Dark shades like navy, charcoal, forest green and black are becoming ever-more popular in kitchens – so if you want to turn the room into a striking, glamorous space for dining and entertaining, now’s the time to do it. 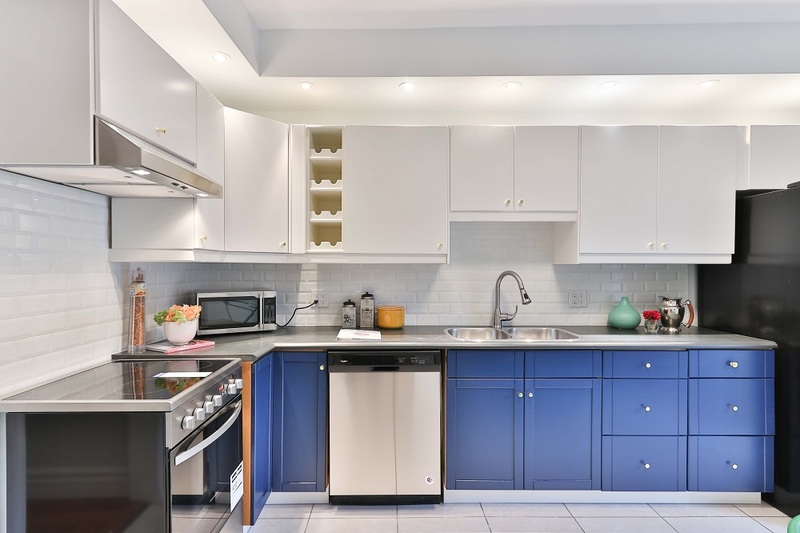 Larger kitchens that get plenty of light will suit matt or painted woodgrain cabinet doors, whereas gloss finishes will help stop an intense colour overpowering the room if space is at a premium. 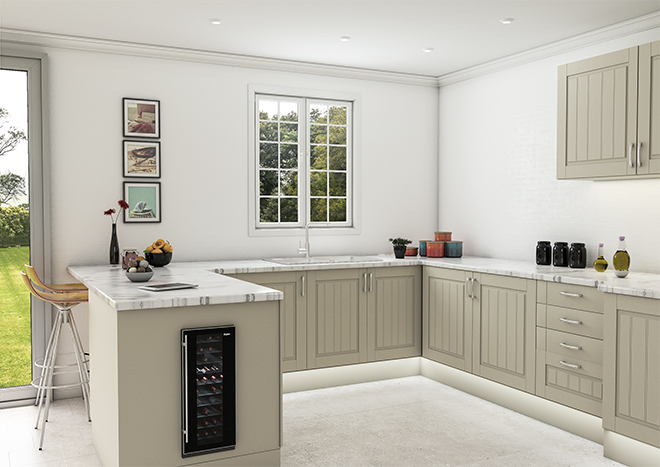 The Visions door in Ultragloss Black will help you embrace this trend in your own kitchen, and will look fantastic when paired with white walls and pale woodgrain flooring. A classic style in a modern finish will give your cooking space real flair – how about the Bella Shaker in Matt Graphite? Greys and cool-toned hues have been the most popular neutrals for the last few years, but a key 2019 trend is set to be warmer neutrals. Think oatmeal, buff, even pale shades of beige. Perfect for smaller cooking spaces, a neutral hue with warm undertones adds gentle light to a room with none of the starkness of plain white. From our ranges, doors in Ivory or Matt Mussel will give your kitchen a touch of subtle warmth while still looking fresh and contemporary. Forget clean, crisp, straight lines – the mid-century look is back, with soft, sweeping curves. Consider upgrading your dining table and chairs and treating yourself to a set that incorporates this look. Another way of working this look into your home is with tiles – scallop-shaped tiles (also called mermaid tiles) are a big thing this year, and as you’re used to seeing square, rectangular or metro tiles in kitchens, their curved shape really catches the eye. 2019 is not the year to play it safe – there’s a lot of vivid, jewel-inspired colours around at the moment. If you’ve got a spacious kitchen, you can make a real statement with your décor – opt for a two-tone look, such as a rich emerald-green and a paler, almost turquoise-green. 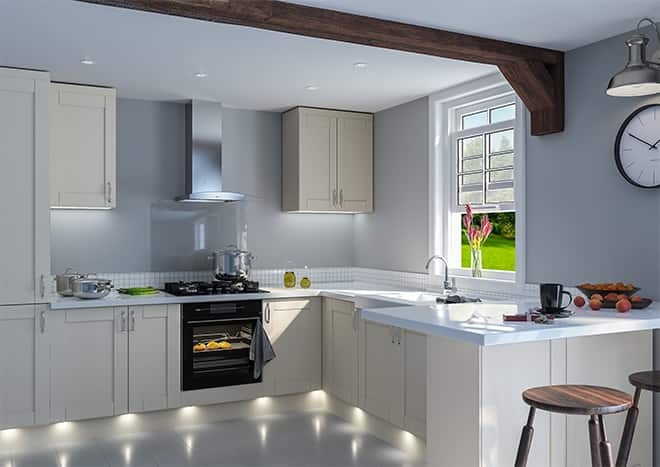 Paintable doors with a simple design on them such as the Kingston are ideal when it comes to nailing this trend, as they can be customised exactly to fit the vision you have for your kitchen. In a smaller space, add bold colour in smaller doses – accessories that really pop will do the trick. Plus, why choose stainless steel or chrome when you can have a toaster or kettle in a bright colour that will cheer you up every time you use them? This composite material of marble, quartz and granite chips set in cement was popular in the 1950s-60s, made a reappearance in the ’80s, and is back once again for 2019. It’s hard-wearing and durable, which means it’s ideal for kitchens, and is a stylish and striking alternative to marble or granite worktops. A wide range of colourways is available, so co-ordinating terrazzo worktops or splashbacks with the rest of the room should be fairly easy.